In April 2017, Patricia Goforth became the first female leader of Booz Allen Hamilton’s engineering and science business, tasked with charting the course for the firm’s 3,400 engineers and applied scientists who build transformational solutions for clients. Trish was recognized last month by Business Insider as part of the “39 Most Powerful Female Engineers of 2018.” The magazine says of the list, “These are women with engineering backgrounds who are running big business units at important companies, are building impressive up-and-coming technologies, or acting as leaders and role models in the tech communities.” Trish is doing all three. Trish now focuses on design, development, and deployment of engineering, digital, cyber, and analytics solutions to meet clients’ mission-critical goals. In her more than 35 years of professional experience, she has lead teams skilled in developing complex technical solutions and integrating cybersecurity into the land, air, sea, and intelligence missions of the Department of Defense. 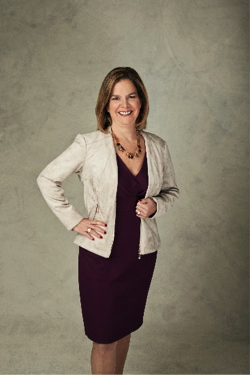 Under her leadership, her team received Booz Allen’s highest professional honor for outstanding customer service for transforming the commercial satellite communications business processes for a defense client. But Trish goes above and beyond her expansive duties at the firm to support and encourage other engineers, particularly women. Under her leadership and in partnership with the Society of Women Engineers (SWE) and iRelaunch, the firm launched the “Return-to-Work Program.” The program provided paid re-entry internships starting in 2016 for talented, experienced women engineers with high-demand skill sets—like electrical and systems engineers, and software developers/engineers—looking for a hands-on program designed to jump-start their return to the workforce after taking a break to care for family or an elderly parent. Learn more about Trish Goforth here. Booz Allen is committed to supporting women in STEM. Learn more here.